This week, we're back with a very special interview with Katy Tur. As most of you know, she's known for her Phish banter on air, and probably better known as the host of MSNBC Live, which airs every weekday afternoon at 2pm ET. She also occasionally fills in on MTP Daily and other NBC news programs. 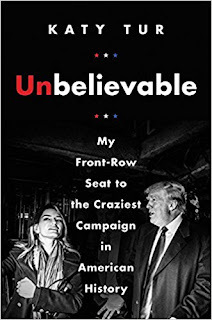 We had a great conversation with Katy, that ranged from her favorite Phish tunes to a history of a fandom, and to her book, which comes out today, September 12, Unbelievable: My Front-Row Seat to the Craziest Campaign in American History. Order it now. You can listen to this episode directly here. If you can, please support HF Pod Plus, where we do a couple extra podcasts every month. And if you haven't yet, review us on iTunes. It helps other people find the podcast. And if you can, support the Mockingbird Foundation. Great cause and a way to bring more music to more people. This seems really interesting. I have a friend currently studying American history, who would love to hear this interview. Will share it with him.